Considering all the big news coming out of Phoenix this week with the closing of Mike Malve's Atomic Comics chain of stores, I thought it was important to give all the news and insight I can. To that end, tonight I'm turning my blog over to Harold "Ole' Greenskin" Kayser, a good friend who's been following the ongoing drama. He and I both thought it necessary to correct some of the erroneous stories that have been published today. Please read the following and spread the word. At Delusional Honesty, we're the little engine that could, and I like to get the full picture. Thanks for reading. Samurai's Camelback location, with boxes & boxes of Atomic's shipment. "Bleeding Cool Gets it Wrong...."
The comic world was rocked by the closing of Atomic Comics, the largest retailer in the southwestern US, on Sunday. That's all I'm going to say about the closing specifically, as I can't add anything else that hasn't already been covered by numerous sites. Atomic Comics customers and the East Valley especially faced a proverbial black hole with the sudden closure. Mike Banks, owner of Samurai Comics, talked with his Diamond Comic Distributors representatives about the situation and feverishly tried to work out a deal to help fill the void. They were successful, and Samurai Comics received the entire Atomic Comics shipment today. He's in the process of getting the product set up and ready for distribution on Wednesday. Also, Mike and his wife Morhya struck a deal late today to open a "pop-up" Samurai Comics directly adjacent to the Atomic Comics location on South Country Club Drive in Mesa. Fret not, Atomic Comics customers! You can go to almost the same location and get your new comics on Wednesday starting at 9:00am. Now, I feel the need to set the record straight regarding the postings on Bleeding Cool, a comics news site run by Rich Johnston. The updated Bleeding Cool post, which includes a few little bits about Samurai Comics. "Local Phoenix store All About Books & Comics has come to a deal with comics distributor Diamond over the store’s outstanding orders..."
At least for this week this statement is completely inaccurate and false. 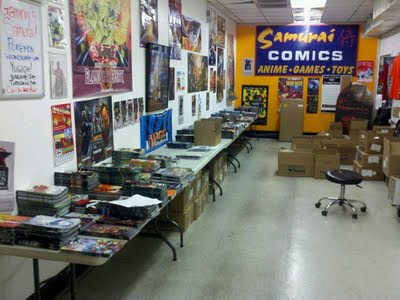 Samurai Comics has received the entire shipment for Atomic Comics and new product will be on hand in the morning. Now, All About Books & Comics might be increasing their shipment orders to handle any extra customers from the Atomic store closings, but they did not receive the shipment this week. To take it a step further, according to Mike Banks, Samurai Comics will be acting as a mini-distributor for all the other local retail stores. If any store runs out of product, Samurai Comics will be on hand to get them what they need from the excess shipment that they are handling. This is big...why? It's not, "Hey, send your customer here so we can get the sale." It's basically working with each retailer for the betterment of the whole, something you don't see every day in the business world. That's integrity, a willingness to help out the competition because it's the right thing to do. Kudos, Mike! AAB&C's site post. Nowhere do they mention they're getting Atomic's shipments. It is my understanding that Diamond will be working in coming weeks with all retailers that are willing to step up and handle extra product that Atomic was handling. It is a sad state...the one store that is truly stepping up and going above and beyond is Samurai Comics and their owners Mike & Morhya Banks. It is unfortunate that other stores are getting the bulk of the credit for riding the coattails of the one taking all the risk and doing all the work. In many of these articles they are not even mentioned first. I personally exchanged several emails with Rich Johnston regarding his Bleeding Cool postings and he basically added the Samurai Comics information after the fact. According to his e-mail, all of his information came from the owners of All About Books & Comics. Once confronted with the truth he basically turned it into a battle of who is the better store rather than focusing on correcting his blog. 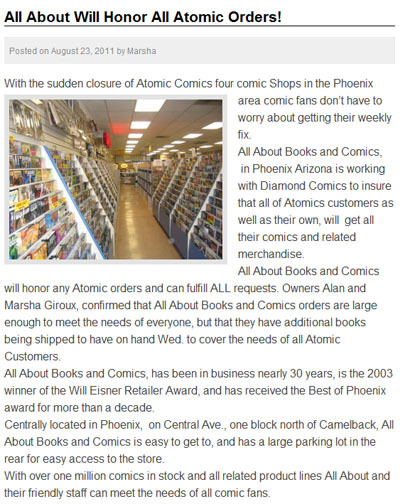 So there you have it: Samurai Comics has Atomic Comics' intended shipments and will be open Wednesday from 9am to sell them in the storefront right next to the original Atomic Comics Mesa Superstore. Please, don't make this a battle of which store is best, like Rich Johnston seems to want it to be. Support the retailer you feel is best deserving of your hard-earned money. It's that simple. For the nonce, Samurai Comics is getting the orders meant for Atomic Comics stores. They're a class act, run by great people. Samurai was one of the first retailers spotlighted by Marvel Comics in their special retailer program last year. That speaks volumes for Mike Banks' commitment to his customers and the industry. Now as far as prepaid stuff goes, that's all to be determined. As Mike Malve did file for bankruptcy, the bank may own the full contents of the stores including your merchandise. You may wish to consult with your credit card company to see if you can get your money back for anything you weren't able to pick up before the sudden closures. Good luck. If you want to contact Samurai Comics, please call the Central Phoenix location at (602) 265-8886 or the West Phoenix location at (623) 872-8886. For now, there is no contact information for the Mesa location, but I'll update this site with any changes. To set the record straight, we did work out a special deal with Diamond Comics Distribution to fill any and all orders we needed for Atomics Phoenix area customers. This was not a fabrication and you can check with our Diamond Comics Customer Service Rep. While we didn't purchase Atomics specific shipment and never claimed we did, we did get the extra merchandise needed so that we could fill the orders of the Metro center and Paradise Valley customers. We have been in business for nearly 30 years because of our integrity and our inventory and customer service speaks for itself. Certainly implied from all the news reports, blogs and on your website with statements like, "All About Books and Comics, in Phoenix Arizona is working with Diamond Comics to insure that all of Atomics customers as well as their own, will get all their comics and related merchandise." How can you get all of Atomics Customers there books if you didn't get the shipment? I agree you may have worked out a deal with Diamond to kick up your orders to handle extra demand from Atomic Customers. Rich Johnston confirmed in an email that you (AABC told them you were getting the shipment, "Because All About Comics tell me they've done a deal with Diamond to provide ordered supplies intended for Atomic to customers." I think people can see the intent...Samurai Comics did the hard part by taking on the shipment and opening the store and you all tried to take the credit. Harold, the manager of Samurai Comics has apologised on your behalf. Hopefully, Mr. Johnston you took the time to apologize for the manner in which you reported the story. While press releases were flying about, another local retailer was making calls and working twenty-hour days so that the East Valley could have a shop right there where Atomic Comics' regulars could easily find it. Within 48 hours, Atomic Comics' shipment was delivered to Samurai's Central Phoenix store. Within 72 hours, Samurai Comics "East" was open right next to the old Atomic Mesa Superstore. And Mike Banks was distributing the books meant for Atomic, not only to his three locations, but also he extended an offer to at least four other area retailers so they could get any extra books they might need from the enormous shipment. And Mike also brought aboard managers from the Atomic Mesa and Chandler locations to maintain continuity with those stores and their customer base. Not to mention, well, they still have jobs. After 20 hour days and working feverishly trying to get the east side store up and going, Mike has cleared up all this talk with his most recent post. On his recent post Mike spoke about the closing of Atomic Comics the future of the east Valley location and a nice little blurb regarding who got the shipment. "Within a few hours Diamond Comics Distribution and the major comic book publishers were able to agree on a plan to redirect the entire Atomic Comics shipment to our store." 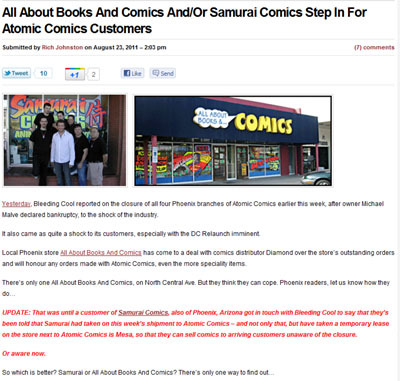 Congrats Samurai Comics and the fans of Phoenix thank you for your efforts.